- "Often when people are switching from a gas rotary mower to a reel mower they are unfamiliar with the differences between the types of mowing. If the mower jams then you are cutting too much grass or pushing the mower too fast; if there is grass left standing after you pass over it then you needed to overlap your passes. - A full double pass is not uncommon when transitioning a lawn (we commonly overlap about 3/4) and most reel mower users overlap 1/3 to 1/2. 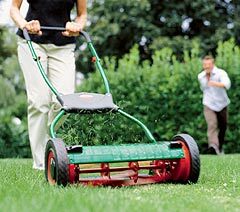 - Maintaining the lawn with a reel mower will improve the health of the lawn and can give it a luxury lawn appearance. You will likely mow slightly more often and in a slightly different manner." The Brill Luxus is a new generation reel mower weighing in at about 16 pounds, easy to push, requires little maintenance, and so quiet you can carry on a conversation while you mow. 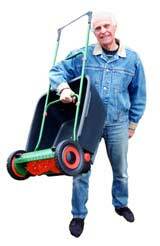 Other reel mowers are heavier, can be difficult to push, and require frequent blade sharpening. Want to know specific differences between push mower models and manufacturers ...check out our Push Mower Comparison Chart and our Brill/Sunlawn Comparison Chart. Already sold on a reel mower, you probably want to read our guide to transitioning your lawn. Why Blades Stay Sharp for 8 Years. The Luxus push mowers, the Accu Mower ASM380 cordless electric, and Sunlawn line of reel mowers have a non-contact cutting system. This means Brill blades stay sharp and you will save money and time on sharpening services. In fact, when you calculate how much money is saved by less sharpening of the blades, the Brill 38 costs even less than an inexpensive mower. Mowing your lawn with these mowers is better for the air, better for the grass, and better for you. Mow your lawn when you will enjoy it...9 am or 9 pm...so silent your neighbors can enjoy their activities in peace. Your children can play safely along side a reel mower: there are no flying objects or toxic fumes. Imagine, you could actually talk to them while you mow! Mowing the lawn just became an enjoyable, family activity. Don't believe that can happen: see our story. For the Brill Luxus 38, assembly is an easy 5 minute, "no-tool" job. At 16 pounds, it can easily be lifted and hung in a closet or on a wall. For best results, we recommend spritzing the blades with a silicone spray before mowing. After mowing you'll want to brush or wipe off the clippings. That's it! No	Tune-ups,	no	sharpening,	no worries. - blades stay sharp for about a decade. Cutting Height adjusts easily from .7" to 1.8"
Silent Cut Design (The reel blade misses the bedknife by less than a millimeter. This reduces friction and allows the reel mower to cut the grass like scissors). See why Reel Blades are better for grass health. Blades stay sharp 7-10 years versus one to two years for other brands. Sealed Ball-bearing mounted reel. That means you don't have to mess with constantly oiling them. Powder coated surfaces are more resistant to chipping, scratching, fading, and wearing than other finishes. Colors stay bright and vibrant longer. Powder coating is also highly protective of the environment, because it contains no solvents. Gap setting gauge included for annual reel blade adjustment. Warranty : 1 year offered by PPM. Replacement parts : no problem, PPM carries everything you could ever need. Q. What types of grass does the Brill Luxus 38 cut? A. The Brill Luxus will cut all grass types except Bermuda and overgrown St. Augustine grass which has been allowed to have thatch. Most of our returns last year were from people with thatched St. Augustine grass. Q. What size lawns can the Brill Luxus 38 reasonably cut? A. 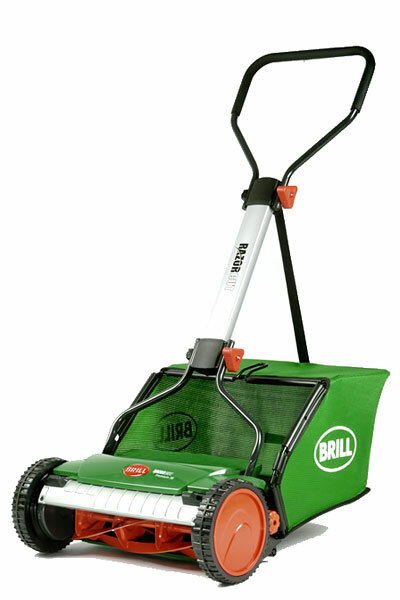 The Brill Luxus 38 is recommended for lawns up to 6,000 square feet. Q. Do you need to adjust the blades? A. After a season or two you may notice that the mower is not cutting as well as when it was new. Each Brill Luxus comes with an adjustment gauge used for resetting the blades. Here's our guide on how to do this quick adjustment. Q. What makes the blades special? A. The blades Stay Sharp for 8 Years. The Luxus push mowers, the Accu Mower ASM380 cordless electric, and Sunlawn line of reel mowers have a non-contact cutting system. This means Brill blades stay sharp and you will save money and time on sharpening services. In fact, when you calculate how much money is saved by less sharpening of the blades, the Brill 38 costs even less than an inexpensive mower. Q. Is mowing with a reel mower going to be different from a rotary? A. A bit, especially the first few times as you transition your lawn. Here is a guide for mowing with a reel mower. How to do that quick little yearly blade adjustment to keep the grass cutting nicely. Brill Luxus Reel Mowers come with a 2 year warranty. Shipping is free for the Brill Luxus Reel Mowers.